In human anatomy, inferior epigastric artery refers to the artery that arises from the external iliac artery and anastomoses with the superior epigastric artery. Along its course, it is accompanied by a similarly named vein, the inferior epigastric vein. 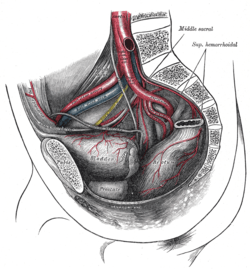 It arises from the external iliac artery, immediately above the inguinal ligament. 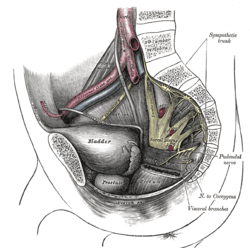 It curves forward in the subperitoneal tissue, and then ascends obliquely along the medial margin of the abdominal inguinal ring; continuing its course upward, it pierces the transversalis fascia, and, passing in front of the linea semicircularis, ascends between the Rectus abdominis and the posterior lamella of its sheath. 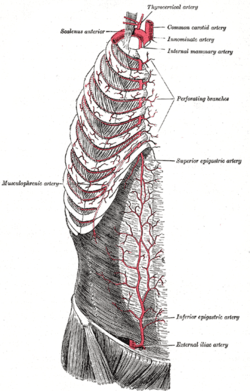 It finally divides into numerous branches, which anastomose, above the umbilicus, with the superior epigastric branch of the internal thoracic artery and with the lower intercostal arteries. 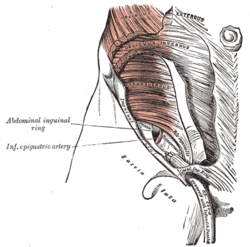 As the inferior epigastric artery passes obliquely upward from its origin it lies along the lower and medial margins of the abdominal inguinal ring, and behind the commencement of the spermatic cord. 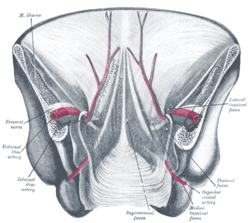 The vas deferens, as it leaves the spermatic cord in the male, and the round ligament of the uterus in the female, winds around the lateral and posterior aspects of the artery. 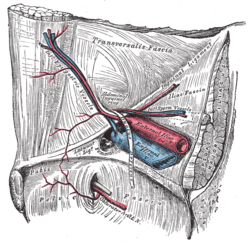 Schema of the arteries arising from the external iliac and femoral arteries. Anatomy figure: 35:04-07 at Human Anatomy Online, SUNY Downstate Medical Center - "Incisions and the contents of the rectus sheath." Anatomy photo:35:12-0104 at the SUNY Downstate Medical Center - "Anterior Abdominal Wall: Blood Vessels in the Rectus sheath"